To this day, Jackie Daly's 1977 duet album with fiddle player Seamus Creagh remains one of the masterpieces of Sliabh Luachra music. For many Irish music fans of my generation, it was also our first introduction to the polkas and slides of southwest Ireland played in the correct style. Since that time, Cork fiddle player Matt Cranitch, most recently of Sliabh Notes fame, has also become one of the better known exponents of Sliabh Luachra music. 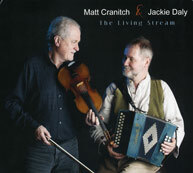 In recent years, in particular, Cranitch and Daly have been regular members of the faculty for the Catskills Irish Arts Week and have spent many hours performing Kerry-Cork music together in the pubs of East Durham NY. So it is no great surprise to find them pairing up for a CD, nor will it be that the product of their collaboration is one of the hidden gems of 2010. "Hidden," because this is music presented without the pretenses or unnecessary clutter of a big production, music played in a straightforward way, where artistry manifests itself in the subtle details. Some of the tunes are fairly well known, but the two musicians always have a little surprise here and there for the attentive listener. Polkas, slides, but also jigs, hornpipes, reels, etc, were sourced from some of the great names in Sliabh Luachra, with the addition of some of Daly's own creations. The two slow airs, one by each musician, are among the finest tracks on the album. Much here is performed without accompaniment--although when called upon to provide one, Brid Cranitch and Paul De Grae are most skilled for the task.